Monday; in Ålesund – the last time before going off on Easter break (in Eastern Norway). I didn’t have too much time for hiking, as I had to pack for the vacation, vax the skis (3 pairs) and so on. But there was definitely time for a quick trip across Høgkubben. The weather was just outstanding! The hike from Høgelia and through the forest in the direction of Blindheim was really a bad idea. Of course, the snow is much weaker in the forest, and I was like 10% on top of it and 90% knee-deep in it. The positive side was that I stumbled across another path that I didn’t know about. The trip: 7,3km, 525 vertical meters. Tuesday; I worked half day, then drove down to Anne in Sogndal. We would drive to Eastern Norway the next morning. So this evening was mostly about getting organized for Easter. 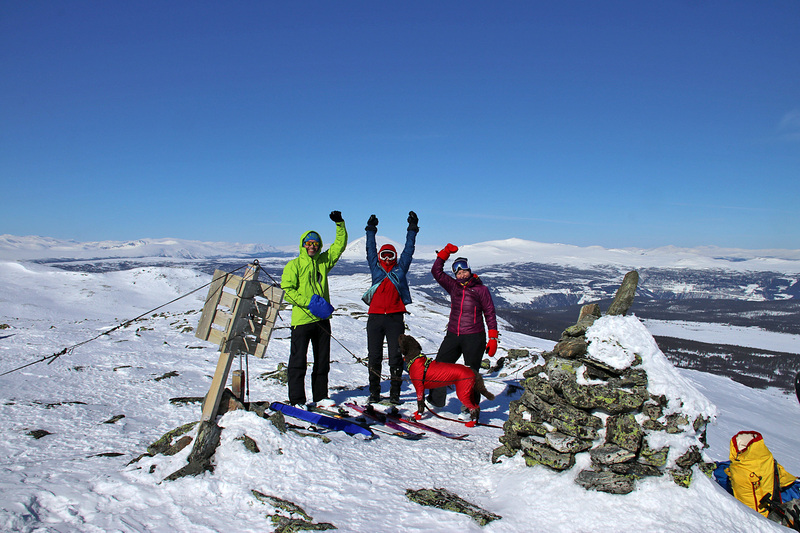 With the stunning weather, it was really tempting to go on an afternoon ski-trip to one of the Sogndal mountains, but there would be enough skiing in the Easter break. Thus, I settled for walking the dog on Stedjeåsen. Wednesday; Easter break! It was a beautiful day when we left Sogndal in the morning. 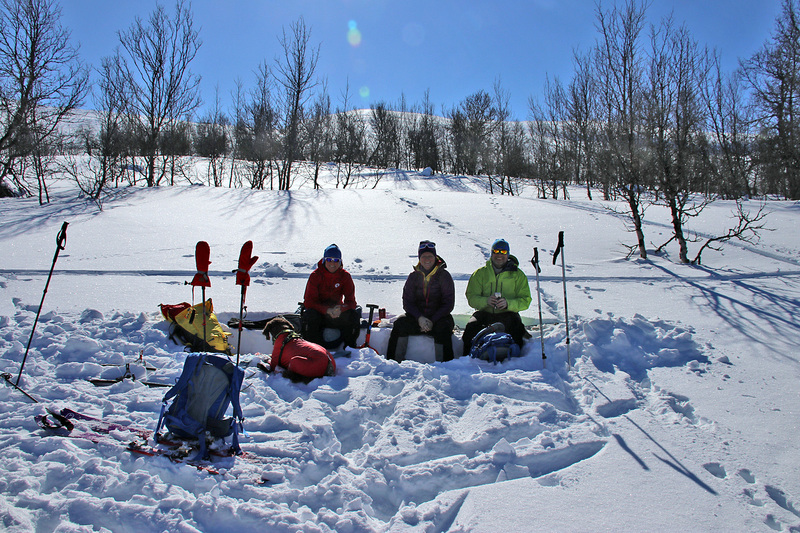 We had agreed to go on a ski-trip on our way to the rented cabin at Gålå. The big question was “where?”. The criteria was; a) it would be a new top for me, b) it couldn’t take a long time and c) Karma would have to be able to walk without drowning in snow. As we’ve been to Eastern Norway several times now, the list of candidate tops was short. But Sandhaugen on Valdresflya (behind Bitihorn) looked promising. New top, short distance and there would surely be tracks that Karma could walk on. We drove; Sogndal – Lærdal – Filefjell – Ryfoss – Skammestein – Beitostølen and when we got to the Bitihorn trailhead, there was a large parking area, and Sandhaugen was surely a go! 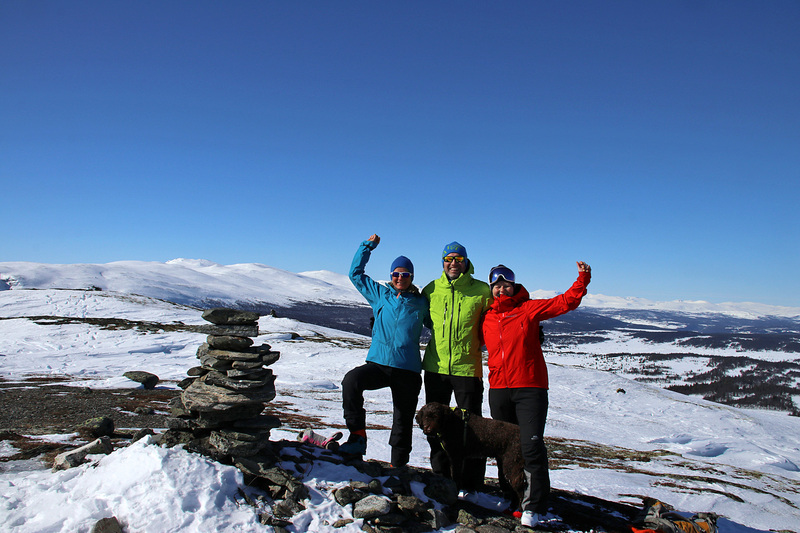 But the ascent went fine, and we could enjoy our first Easter top, with a superb view towards Jotunheimen. Descending the ridge also went OK, albeit somewhat challenging when Karma tried to run when I was trying to brake. Skis without steel edges are not much worth in these conditions. But all in all, it was a very nice and short ski-trip, and we could now focus on getting to Gålå and our rented cabin. The cabin was nice, and we had just settled in when our friends Lena and Terje arrived (also from Sunnmøre, western Norway) in the late afternoon. Nice cabin, superb weather forecast, good friends, good food – I reckoned this would be a mighty be a fine Easter break. The only downside was that Lena had caught a cold and was not in top shape. The trip: 6,6km, 290 vertical meters. On Valdresflya. Road opened early this year! Thursday; During breakfast, I told the others that if I could get to the four new tops with a primary factor > 100m during this Easter, I would be a happy dude. 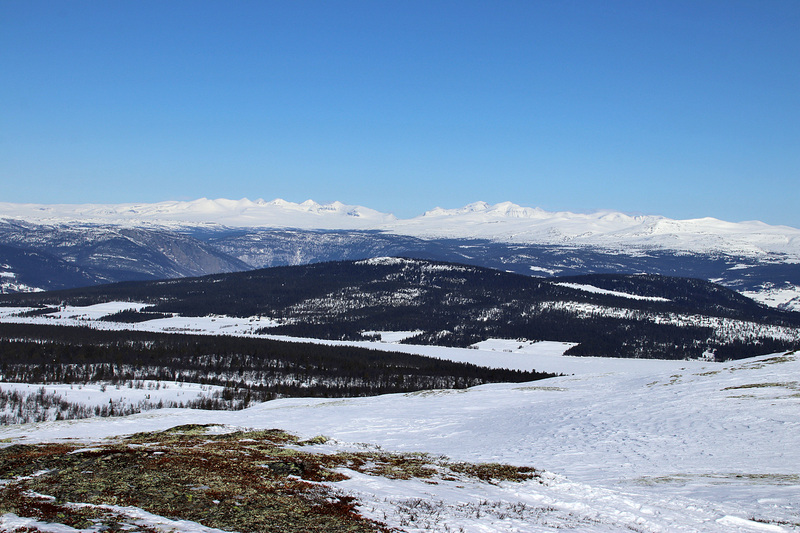 These tops were; Feforkampen (1160m), Kvitberget (1000m), Trollhaugen (1052m) and Valsfjellet (1148m). The others were supportive and we decided to start the day by skiing Feforkampen. It would be a short ski-trip, even something Lena assumed she could do, given her condition. We drove to the slalom hill at Fefor and headed up the outskirt of the slopes. The summit was located not far above the ski-lift. We tried to ski up, but had to walk on foot the final 40 vertical meters. The snow was hard as ice and there was also a potential risk of a long slide, should one be unlucky. But we reached the top, enjoyed the views for a little while and returned to the skis, all safe and sound. The others ran down the main slope, while I tried to maneuver Karma in the outskirts, trying to avoid other skiers. The trip: 2,7km, 240 vertical meters. 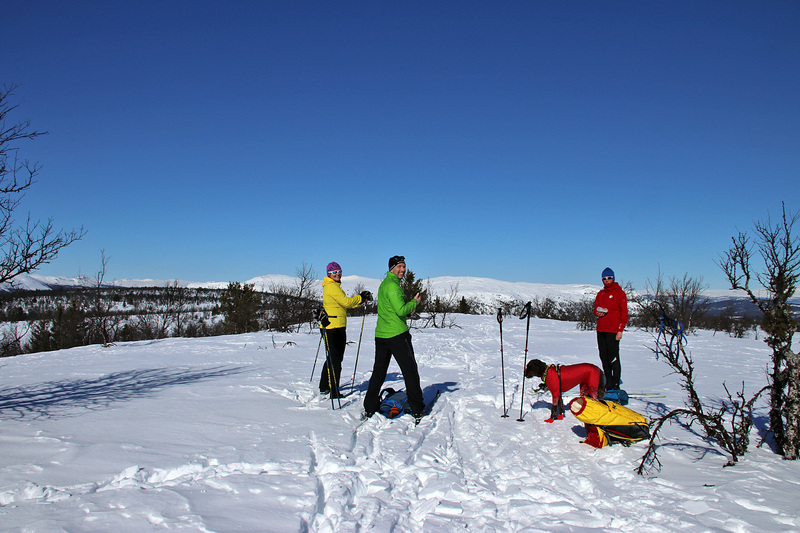 Still Thursday; as the trip up and down Feforkampen was relatively short, we agreed to ski Kvitberget also. 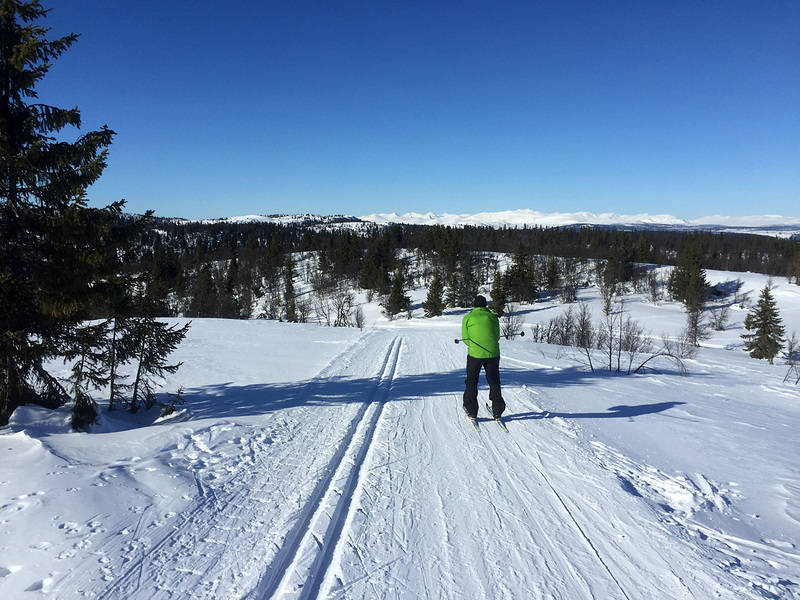 I wanted to ski from the Fefor – Gålå road, but there was no parking, so we had to drive up to Rudlandsætra and head out from there. This meant it would be another, very short ski-trip. But the top was the main focus, and I could always go skiing properly in the afternoon. The trip: 4,1km, 100 vertical meters. 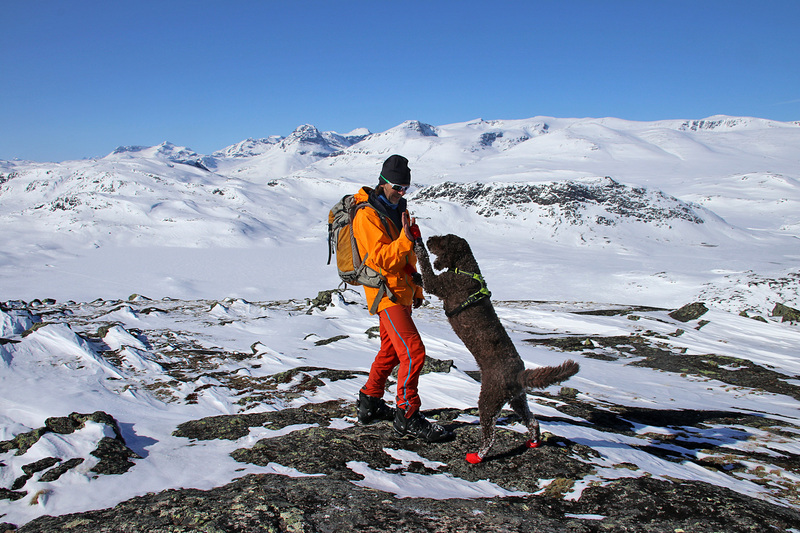 It didn’t take us long to reach Utsiktshøgda, and we decided to continue a bit. Then we saw a signpost saying that Skjerellkampen was less than 4km away. With these superb tracks, it wouldn’t take that long to get there. It was a really, really enjoyable ski-trip. We had semi-good skis, meaning adequate grip and glide, but far from good. But that didn’t take away a feeling of “flying through the country”. 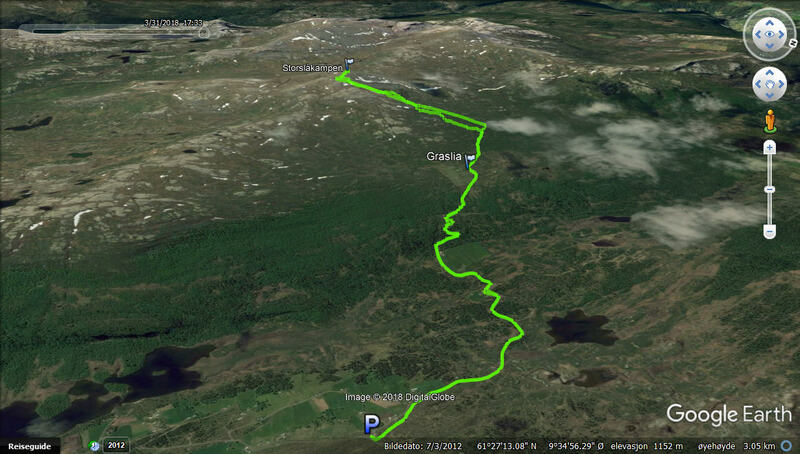 It was roughly 6km to the top of Skjerellkampen, and another 6km back along different tracks. Karma got her fair share of downhill running. While the terrain felt altogether flat, we still covered 300 vertical meters on this trip. The trip: 12km, 300 vertical meters, 1h:45m. 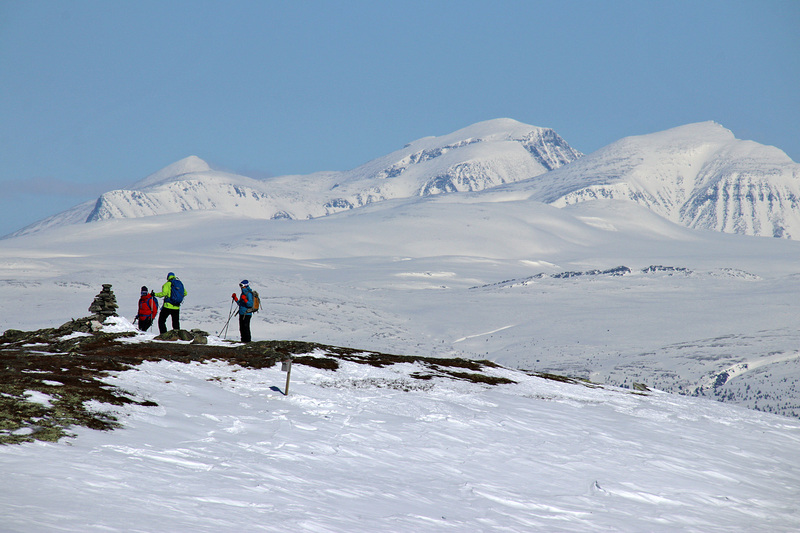 Friday; today’s goal was Årstulhøgda (1052m) aka Trollhaugan, a moderately long ski-trip from the cabin. 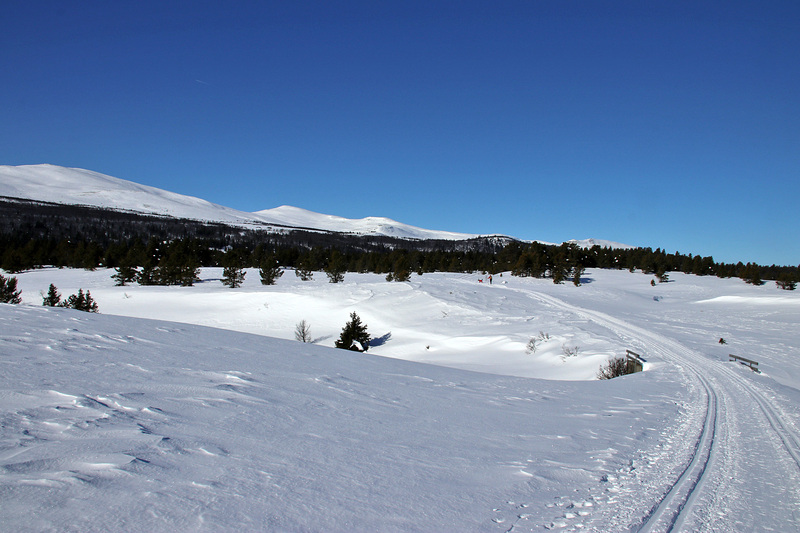 The weather was still gorgeous, and we looked forward to a nice ski-trip along perfect tracks. We started out rather early, so there weren’t many skiers out yet. Which meant I could let Karma go unleashed. She seemed to enjoy life outside the tracks better than on them. We got a bit confused when real tracks didn’t match the tracks on skisporet.no. But we followed signposts towards Årstulsætra, knowing the direction was correct. The track led us to the west side of the top, opposed to the east side, where we had expected to end up. But eventually, after approx. 7,7km of skiing, we could celebrate our 3rd Gålå/Fefor top, with a primary factor > 100m. We discussed doing a round trip, via Årstulsætra, but decided to follow the same route back to Gålå. The trip: 15,1km, 240 vertical meters. Anne enjoys skiing. A lot! Karma – the off-trail dog! Still Friday; after a lunch at the cabin, Terje and I decided to go for another ski-trip. I wanted to test my skating skis and Terje had no other option than to use his cross-country skis – with built-in skins. 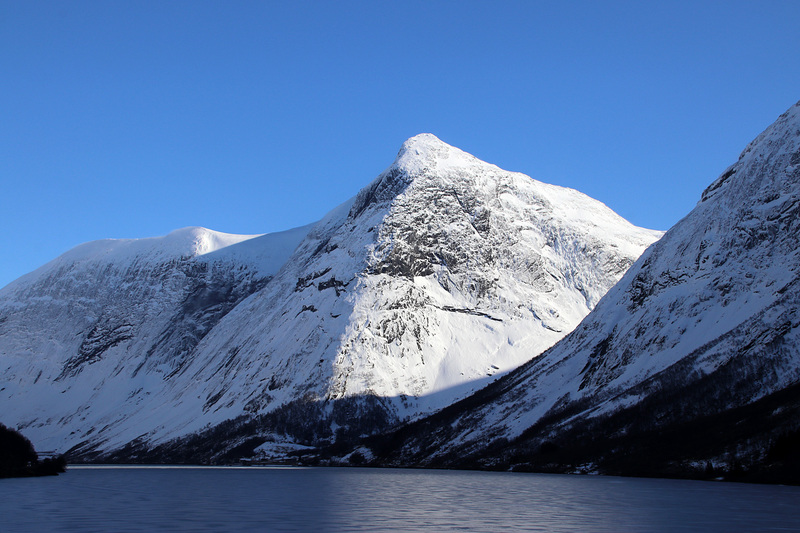 The target would be Isumhøgda (991m). In this type of terrain, Terje stood no chance against my skating skis. I felt I was flying along, even though I don’t have the proper skating technique. I mean – I think I do fairly OK, yet realizing that a professional would roll over, and die laughing. We switched skis for a couple of minutes. That was horrible. On the flats, it felt like skiing with brakes on. I will NEVER buy that type of skis. And even though I had a hard time in the uphills with skating skis on, I could always put some vax on. But the point is really to have no vax at all. After approx. 7,3km, we reached the top of Isumhøgda. 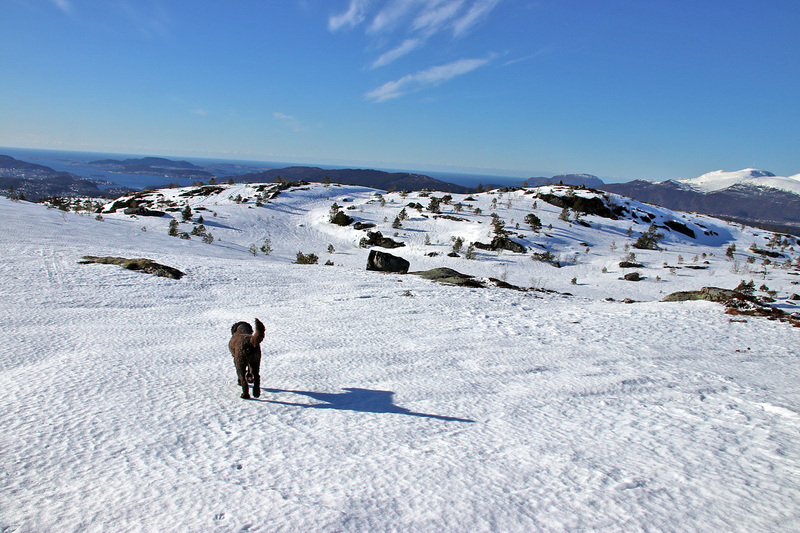 Terje was a bit tired (from the lack of grip – despite the skins) and did not fancy the idea of a longer way home. I still managed to talk him into continuing, as we didn’t know for sure that the route ahead would be longer or shorter than the distance we had covered. It turned out it was only marginally longer, so it was a good decision to continue, even if we had done the most of the remaining route the day before, on our way to Skjerellkampen. How nice it is to return to the cabin, having covered more than 30km on skis and enjoy a nice dinner and a wonderful dessert (thanks, Lena! ), and just relax the body and mind for the rest of the day. Everyday concerns just cease to exist. That’s what vacation is all about! The trip: 15,6km, 265 vertical meters. Saturday; from our rented cabin, we look straight towards Storslåkampen (1428m) – on the other side of the valley – 10,9km away. This top had been a major goal, but we waited until Lena showed signs of progress, with respect to her cold. This morning, she seemed better, and we decided that Storslåkampen was a go! 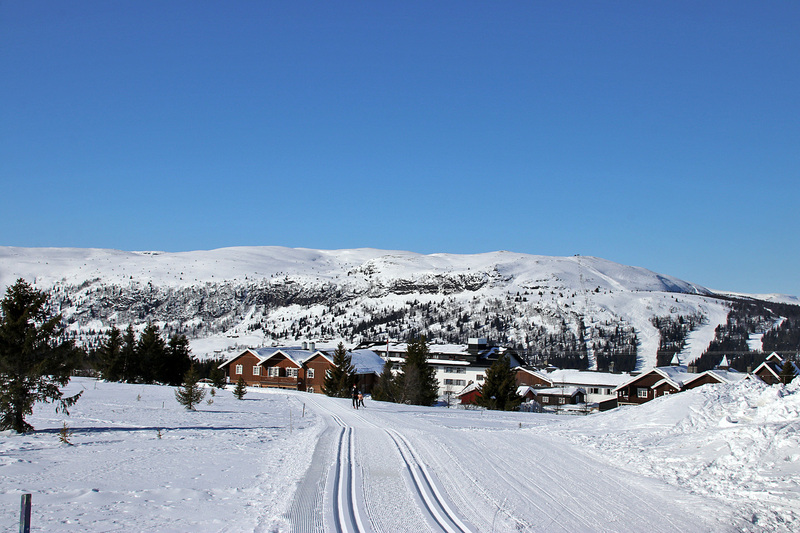 For the locals, the real Easter trip is to ski from Gålå to Ruten. It is an “adult” trip, and totally out of the question for us, today. Anne and I skied Ruten from Espedalen 4 years earlier, and as I hadn’t been to Storslåkampen yet – the choice of mountain was not difficult. Moreover, I would rather have a relatively short ski-trip from Fagerlia and THEN a trip on skating skis later in the day, than a long ski-trip to Storslåkampen from Gålå. The road up to Graslia allowed for an easy ascent. From here, the track went westbound all the way into Lomdalen, but we got restless halfway and decided to head straight up the mountain. The snow was very variable, ranging from icy to sastrugis. I didn’t fancy skiing down here, and my idea was to descend Storslåkampen along the north ridge. But – the route gave us an easy ascent and eventually, we could celebrate our 4th Easter pf100 top together. There was a slightly cold breeze on top, which we reacted differently to. I hardly noticed it. Especially after putting on a dove jacket under the gore-tex jacket. The north ridge had barely any snow, so we decided to descend along our ascent route. The descent wasn’t nearly as bad as I had feared, and it didn’t take too long to get back to the prepared track. We decided to break for lunch in the sunny and wind-free birch forest. The descent from Graslia was quite fun. The forest offered nice powder snow and it went quite fast at times. It was not so fun to put the skins back on, in order to get back to the trailhead. But all in all, it was a wonderful trip! The trip: 14,3km, 695 vertical meters. After 2km, we finally climb! Still Saturday; once back at the cabin, I got a bit restless. We had a short after-ski moment on the balcony, and then I told the others that I wanted to go on a skating trip. I normally like to stop by a named point, and as we had passed by Blåbærfjellet the day before, that would be my named point. From the Gålå ski-stadium, I followed the same track as we followed the day before, on our way to Årstulhøgda. The off-track visit to Blåbærfjellet was VERY cumbersome. Skating skis have no value in deep snow. But I got to the high point, and then back on track. I continued south, in the direction of Årstulhøgda, feeling like “flying”. A wonderful feeling! Then, I continued in the direction of lake Jetningen and suddenly, I felt quite far away from Gålå. That was not really the reality, and it didn’t matter. Skiing was awesome! I passed skier after skier, skiing classic style. I like passing others. End of story. The trip: 11,5km, 150 vertical meters. Sunday; this was our last day with Lena and Terje this Easter. But before they left, we were to visit Valsfjellet. When I woke up this morning, I suspected that whatever type of cold Lena had brought along, she had now shared it with me. My nose was stuffed and my throat was soar. I would certainly be able to ski to Valsfjellet, but the planned 20km skating trip in the afternoon was quickly dismissed. Lena and Anne drove down to the bottom of the Valsfjellet slopes, while Terje and I skied from the cabin. We followed the marked “Valsfjellet” route at first, but ended up in one of the slalom slopes down from Blåbærfjellet. We met the girls by the ski-lift, and followed the “Valsfjellet” route upwards, running in the outskirt of the slalom slopes. Eventually, the route merged with the slalom hill, but there were not a lot of skiers at this hour of the day. At approx. 1020m, we left the track and sat course for the summit. Or at least what we a) thought was the summit and b) what my GPS map said. But 250m to the south, there was another hump with a signpost, and we had to go and check if out. This signpost said “Valsfjellet 1148m”, while norgeskart.no said this was 1148,5m, and the top we came to first was 1149m. In any case, we had been to the top! The others, at 1149m, seen from 1148,5m. Rondane tops look mighty close! Then we split up. The others would run down the slalom hill, while I took Karma down the same way we came up. I had big fun, as there were no one coming up, and I could let Karma run unleashed. I also enjoy this type of route – bumpy and curvy – much more than a regular downhill slope. I met the others back at the ski-lift. 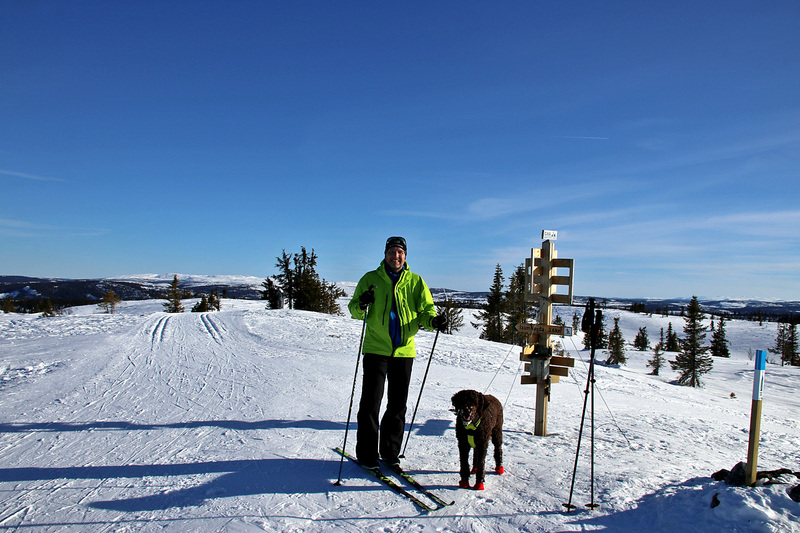 Terje decided to drive up with the girls, while I took Karma and skied back up to Gålå. Lena and Terje left shortly after. I did not feel top of the world, but as I had been in so much activity, the body decided to support me with enough energy to get me back to the cabin. And then I basically “collapsed“. Many thanks to Anne who served a lovely dinner from the grill. The trip: 14,3km, 600 vertical meters. Karma – still restless after busy days? OK, then we go skiing! 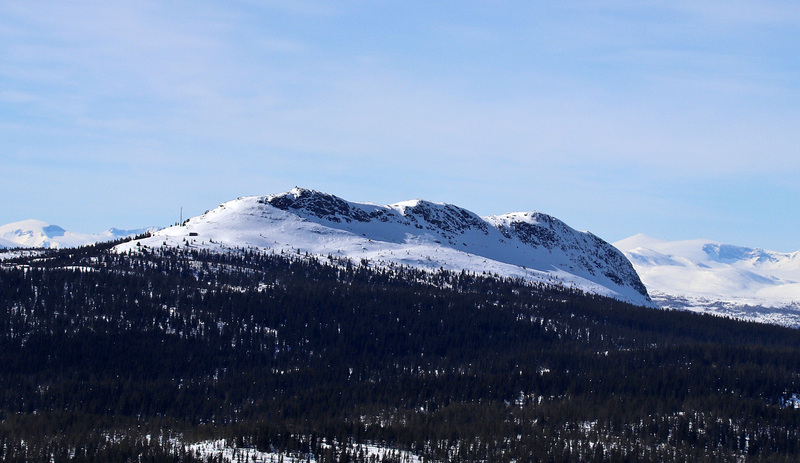 Storslåfjellet – visited the day before! My tracks for the Easter. It was a good break!